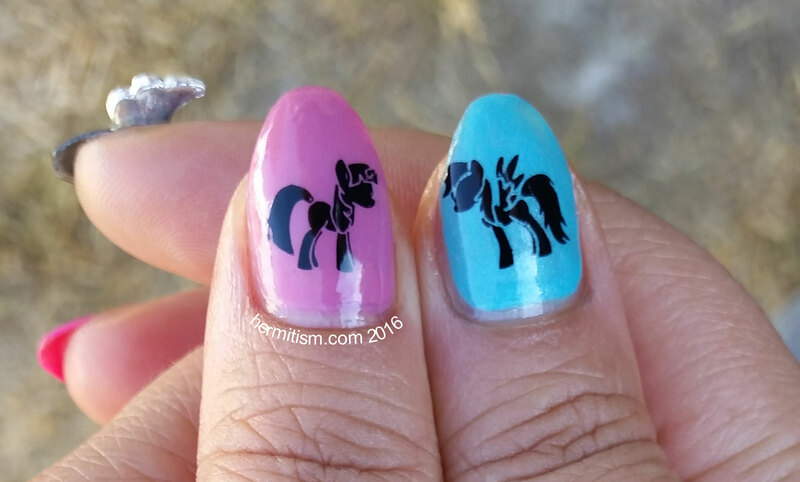 This week’s letter is ‘M’ and I had planned on a My Little Pony nail art despite the massive struggle I had when we were on ‘E’ and I chose Equestria Girls. I’d like to say it was in celebration of season 6 of My Little Pony: Friendship is Magic being released on Netflix, but that is just a happy coincidence. Also, now I need to get caught up again because I barely managed to finish season 5 two weeks ago. After struggling so much with the last pony theme and with how much time it took me to do ‘L’ is for Lemons and Limes, I wanted to keep things as simple as possible. I even decided to skip having a gradient on each nail. Solid colors. Solid silhouettes. Annnd some holo polish and, hey, these beautiful nail charms I found on ebay. I was happy just to own them and get to caress them with my eyeballs every now and then, but they deserved better than that. It’s amazing how many bottles of polish a person can own and yet still struggle to find the colors they need. I think I did a little better this time, partly because I just had to get it close to each pony’s body color and then slap a black silhouette on top. And can I give a shout out to the nail stamping plate I used? I chanced upon someone getting rid of their nail art collection on ebay and I am so glad I bought it. I have not been able to find it anywhere else. 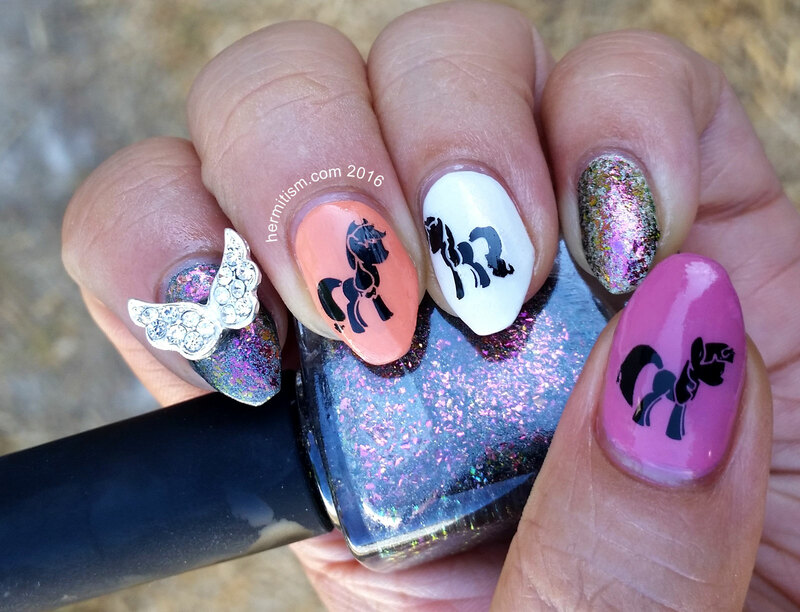 The only other My Little Pony nail plate I have seen doesn’t even begin to match this one in awesomeness (still want to own it though). 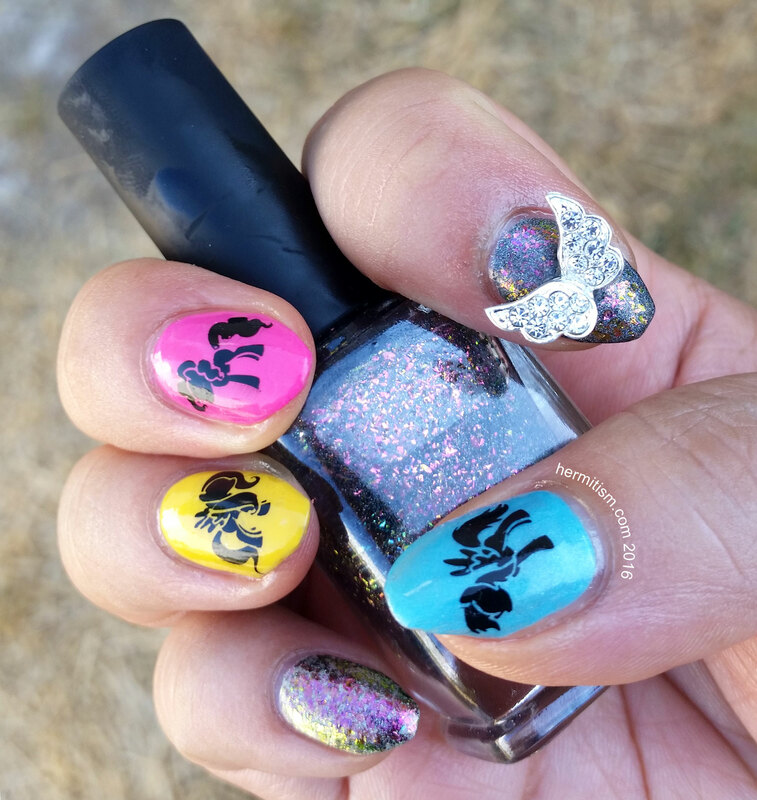 I painted the darker holo (Beyond) onto my index finger and the lighter one (Kismet) on my pinkie and topped them with ILNP’s “Electric Carnival (H)”. Ever since I saw JessFace90’s Holographic Multichrome Flakies | Swatch and Review video I have been coveting their nail polishes. They are the first indie brand nail polish I have ever purchased and it was worth every penny. Electric Carnival has one of the best color shifts according to Jess and the amount of time I spent admiring my nails agrees with her. Given how the nails looked, I think it’s pretty clear it pops more on a dark background. You can bet I will be experimenting with ILNP’s polishes more in the future. It has also occurred to me that I haven’t linked to any information about the ABC Challenge besides the InLinkz. 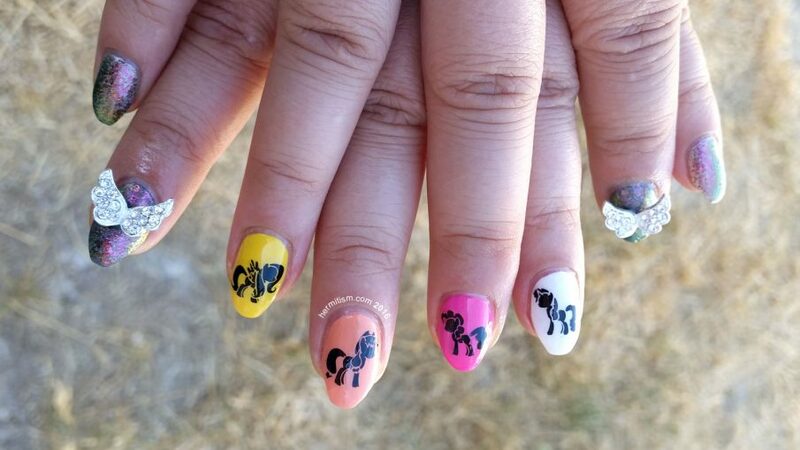 It was started by Nail Polish Society and she posts the InLinkz code here. It runs from Friday to Thursday and anyone can participate.